MERIDEN - Marc Verderame had no idea it was coming. 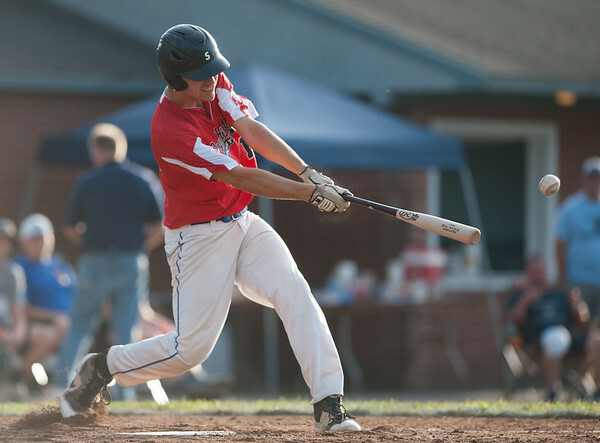 After a night that almost spanned two full games, the Southington Legion baseball team snuck up behind their head coach and down came the water. After all, it was a night with plenty to celebrate about. Southington took down top-seeded Cheshire 5-0 in 13 innings in the Southern Division Super Regional final Tuesday night at Ceppa Field to clinch a spot in the championship series for the first time since 2013. After 12 innings of struggling to get anything going, the Southington offense finally broke through in the 13th. With Cheshire’s Ben Schena on the mound, first baseman Brayden Cooney drew a bases-loaded walk to take a 1-0 lead. Jeremy Mercier followed up with a grand slam two pitches later to give Southington a commanding lead it wouldn’t lose. Jason Krar got the start on the mound for Southington, but went just one inning, giving up one hit and one walk. Ryan Sheehan came in in the second and went 5 ⅓ innings without allowing a hit. He struck out six and walked six. Mercier was strong out of the pen as well, tossing 6 ⅔ innings of two-hit ball. Because Sheehan threw 103 pitches in the game, he will not be available the rest of the tournament. The coaching staff debated taking Sheehan out after the fifth inning when he had 80 pitches which would have kept him eligible to pitch Saturday in the championship. But they decided against it and Sheehan pitched into the seventh. Cheshire came into the game having just knocked out Naugatuck by a mercy rule, 13-0, Monday night to stay alive in the tournament. But Southington proved to have Cheshire’s number at the end of the season, winning the last three matchups between the two. In the Super Regionals alone, Cheshire’s offense, which had the most runs scored in the state in the regular season, was shut out in both games by Southington. Southington will play either RCP or Ellington, who will play in a win-or-go-home game Wednesday night at Muzzy Field. The best-of-three final series will begin Friday, with a new state champion being crowned Saturday. Posted in The Bristol Press, Southington on Tuesday, 31 July 2018 23:30. Updated: Wednesday, 1 August 2018 10:05.